Namibia may be just next door to South Africa – in fact, it even used to be known as ‘South West Africa’ – but it’s a world apart. It’s bigger than France, yet has a population of only just over two million. Its capital, Windhoek, is a modern and progressive city, but the vast majority of the country is undeveloped and hasn’t changed in several thousand years. But that’s part of the attraction of a horse riding holiday in Namibia, as there are endless opportunities to saddle up and tackle some beautifully rugged and remote terrain in beautiful desert country, in some of the most challenging horse riding holidays we offer. 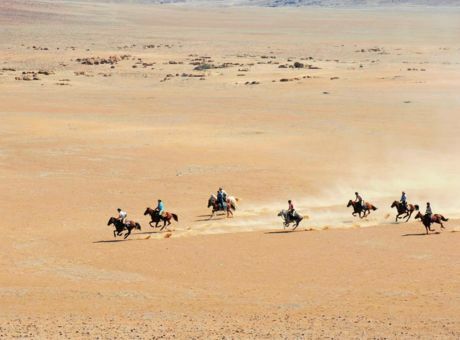 The Namib Desert is the oldest desert on earth, and crossing it on horseback is not for the faint-hearted, so we advise all who are considering horse riding holidays in Namibia to consider one of our other destinations instead if they are not of at least an intermediate riding level. For those with the necessary skills, The Desert Ride offers spectacular and fascinating contrasts which guests breathtakingly enjoy – from Khomas Hochland mountains and escarpment to the Kuiseb Canyon; the Tinkas, Tumas and Welwitschia plains; Moon Valley; the seasonal Swakop River, and the coastal dunes of the Atlantic Ocean. The Namib Desert Ride operates on selected dates only, but there are also a number of other horse riding holidays in Namibia to choose from on other dates, such as The Damara Elephant Ride, The Great Fish Canyon Ride, and an Exploratory Safari Ride, where the route may not be finalised until you’re actually doing it! The common thread between all these great horse riding holidays in Namibia is that you will come home with fantastic memories, enhanced riding skills, and a whole new appreciation for the beauty of Africa. 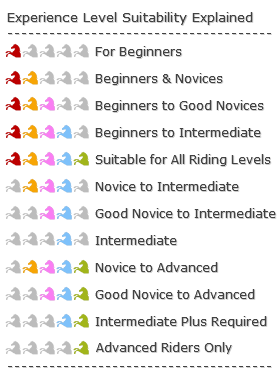 Jill and I have personally vetted our horse riding holidays in Namibia and so we can vouch for their quality and enjoyment. We hope you decide to go experience them for yourself.